iPhone and iPod cases come in various shapes, sizes, and levels of protection, but rare is the case that lets you connect your iPhone to a dock while you’re using it. The extra thickness of a case near the 30-pin dock-connector port can often make it impossible to connect your encased device to anything other than a standard Apple 30-pin USB cable—a predicament that for years has irked owners of iPhone and iPod speaker docks, alarm clocks, and other such accessories. CableJive is offering a solution to this dilemma with the new dockStubz, a pass-through adapter designed to fit into even the narrowest of case dock-connector openings. The dockStubz is a tiny, 1.3-inch tall adapter that connects to your iPhone or iPad’s 30-pin dock-connector port and provides its own narrower dock-connector port. 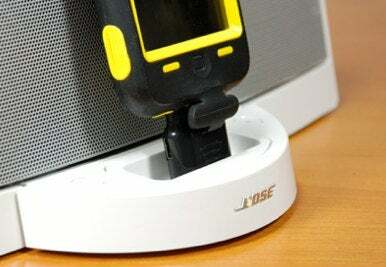 This gives you the ability to dock your iPhone, iPod Touch, or iPad without needing to remove it from its case. When connected, the $23 adapter passes all functionality through to your device, meaning that your iPhone, iPod Touch, or iPad will behave just as it normally would when docked. The dockStubz also includes charge conversion circuitry for older docks and accessories that use FireWire for charging—you can even use a new iPhone with a first-generation docking station, if you’d like to. It also includes a mini-USB jack on the side, which you can use to provide more power to your device if, for whatever reason, it isn’t getting enough. CableJive claims dockStubz will work with every case, cover, or skin on the market, except Apple’s own iPhone 4 bumper case.